New! Watch video of the entire concert, below! Concert: Sunday, March 4, 2018, 8:00 p.m., Koski Plaza/ACE Building Pre-concert talk: 7:30 p.m.
2018 is the 200th anniversary of the publication of Frankenstein, and we celebrate by using Mary Shelley’s enormously influential work as the basis of John Cage’s Circus On, a template for turning any text into a performance. “It’s Alive! a Monstrous Circus On Frankenstein” will be our live, multimedia presentation, sprawling over the outdoor Koski Plaza and all levels of New College’s ACE building. Twenty-seven live performers (and one disembodied voice): New College students, faculty, and staff, instrumentalists from ensemblenewSRQ and State College of Florida, and members of the community will sing, play, declaim, emote, perform, make noise, and wreak general havoc. Come see the monster if you dare! 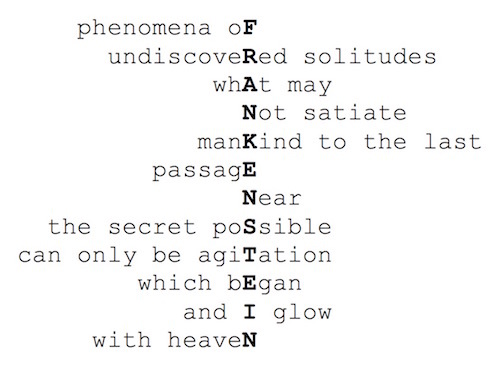 Students working with New College Professor of English Miriam Wallace used Cage's process of transforming the text of the 1818 version of Frankenstein into "mesostics," a type of poem created using words from the base text that contain the letters of the text's title, following certain rules (you can see examples on this page or look at all 256 of them here). These mesostics will form the new text of our performance, which will also incorporate sounds, music, and references to places found in Frankenstein. We will have performers on all levels of the ACE (Academic Center) Building and the adjacent Koski Plaza, so you as the audience will choose your own receptive experience—shape your own destiny, as it were—as you move around the Plaza. So out of one text we create a new, fractured hybrid, one incorporating the original but with a life of its own. Part book, part music, part theater, part light, part sound, part video—Will you have the courage to experience the monster? 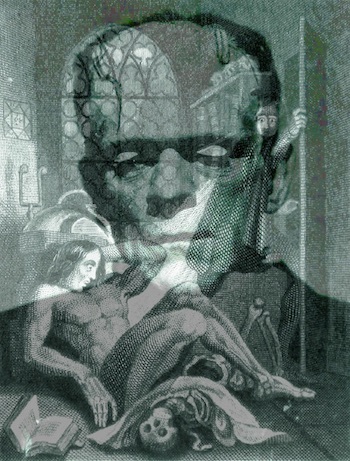 Click here to view a PDF of all 256 mesostics we created from Frankenstein. Here are the rules for creating our mesostics: Starting at the beginning of the novel, look for the first word containing an "F" but not the following letter (so no "R"). This is the first word of the mesostic. Then continue reading, looking for a word containing an "R" but no "A," then one with an "A" but no "N," and so on, until you have "FRANKENSTEIN" in a vertical row. 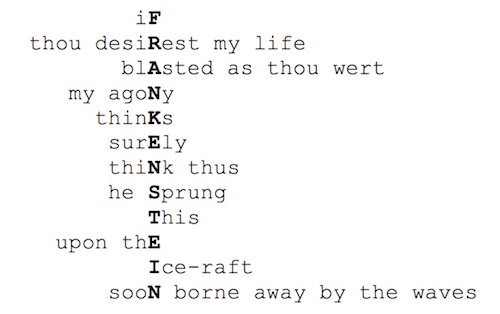 All letters should be lower-case, except for the FRANKENSTEIN row. Cage then says you can add other adjacent words from the text, before and/or after the mesostic word, "according to taste." Some of our mesostics are "pure," with no added words (mesostic 18, for example), while others add words on both sides of the center words (like mesostic 137). Sponsored in part by a grant from the Andrew W. Mellon Foundation.